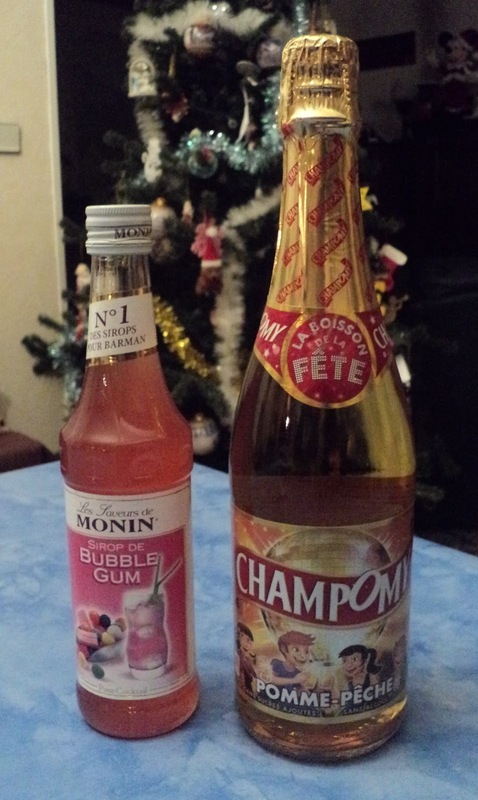 Here's what many French kids will be toasting with for the New Year.... On the right, a very popular kids' beverage, meant to resemble the adults' champagne. The Champomy (shahm po' mee) pictured here is apple peach flavor. I remember the first time I bought this stuff (reluctantly) all too well. My French nieces were coming for Christmas and I bent to my kids' pleadings. They were so proud to show their cousins what Tante Kelly had bought that an over-excited Ellie dropped it, smashing the bottle to pieces and sending stickiness to the four corners of my dining room. I gave my usual broken-glass-on-the-floor-don't-anybody-move speech, "Pretend you're on an island and the floor is the water. Don't get wet," until I could mop up all the mess. The liquid splashed inside the slats of our human-sized radiator (something for a future post) which left a peach-flavored after-scent for weeks... Ah, memories. The stuff on the left is a "see'-roh," a.k.a. syrup. And no, "bubble gum" is not French. I never buy syrups, but with guests on the way, well.... I bent again. You add a dash of this to water for a kids' drink. But when Alex saw it on the table, he said, "Wow, bubble gum alcohol." I looked over his shoulder to see that there was a recipe for a vodka drink with this stuff. I hadn't noticed the #1 for barmen comment on the top.